Portions of central Illinois and central Indiana will likely see dense fog Wednesday night. Limited and rapidly-changing visibility can be expected and those traveling should stay cautious. Visibility should improve however, as showers and isolated thunderstorms are expected to take place Thursday. 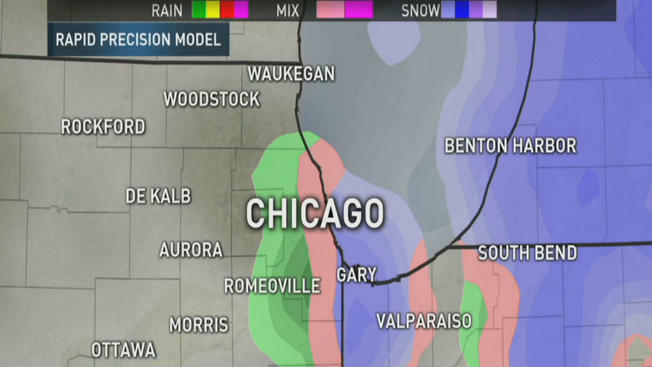 The rain could mix with or change over to wet snow Thursday morning, mainly over far northern Illinois. If this occurs, snow may come down fairly hard for a few hours. Surface temperatures will be above freezing initially, though if snowfall is of sufficient intensity, some accumulation could occur. Sunshine is expected to return Friday with breezy, cool conditions in the low to mid-40s. Temperatures should remain in the 40s going into the sunny weekend, though ending Sunday with the possibility of some showers at night.